I am so excited about the new issue of Quilting Arts In Stitches emag! I'm thrilled to be a contributor... but really the emag is packed with amazing stuff. You will not find this magazine at book stores or Michaels or Joanns. 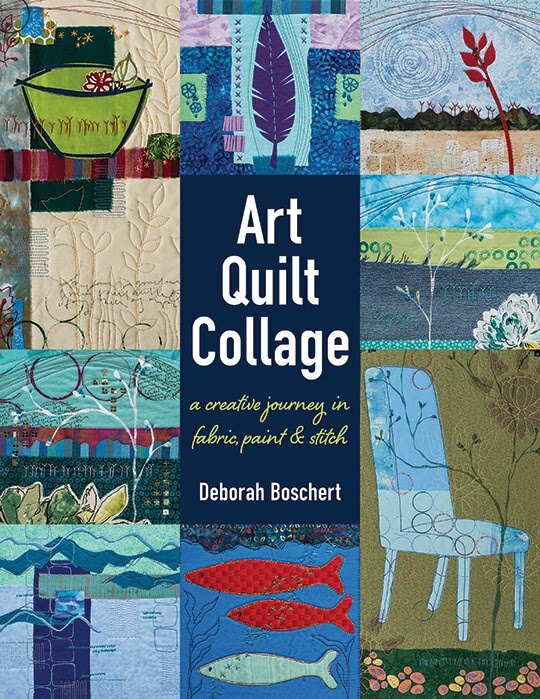 It's only available as a download from Interweave, the publishers of Quilting Arts and Cloth Paper Scissors (so you know it's fabulous!). Why do you have to download it?! Honestly, I've never seen anything like it. It's like a perfect combination of magazine, tv show and live presentation. 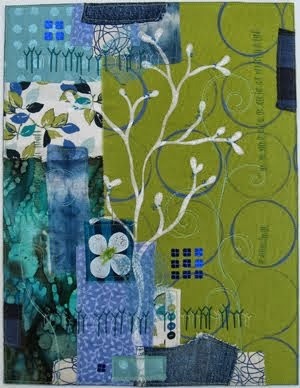 Profile of art quilter Marianne Burr including many beautiful pictures of her work and studio. Lyric Kinard's discussion of resolving design problems using stitching and paint. Judith Trager insightful live interview about her amazing in-progress triptych. Even the bios for each contributor are full of wonderful info about their stitching techniques, inspiration and favorite fiber artists. There is so much personality in the bios -- way more than you get on the contributors page in a regular magazine. Plus, there's my article about creating sheer silhouettes like this one. The article includes images of several more small fiber collages that I created with this technique. Ok, let's be honest. It's pricey. The download costs $14.97. That seems like a lot for a "magazine." But, really it's so much more than a magazine. It's like a taste of visiting a gallery, taking a workshop, planning a new project and chatting with other artists -- all in on. Plus, you are supporting artists and art quilting by purchasing In Stitches. I think it's important to encourage the enthusiasm, support and innovation bubbling up in our world of fiber art. In Stitches is taking it to the next level! Check out the full list of the contents plus lots of helpful Q&A about exactly what you get with the In Stitches download here. Hold off on a couple of trips to Starbucks or a yard or two of fabric and treat yourself to this cool new publication! I'm guessing it will be as stimulating as a double shot espresso and as inspiring as the latest fabric designs! This sounds really exciting. Congrats! I would love to read your article because you know this is a technique I want to see, but won't pay $15 for anything these days. Pokey may be pricing herself out of the market with this. I also drive past Starbucks. I read things once and then stack them up on the bookshelf. But congratulations on the being "in video" rather than print.